Organizations who adopt one of the TJC campus’s 17 “spots” agree to clean their spot at least twice per semester. Then, in the fall, TJC officially “adopted” its own campus through the City of Tyler’s Keep Tyler Beautiful program. 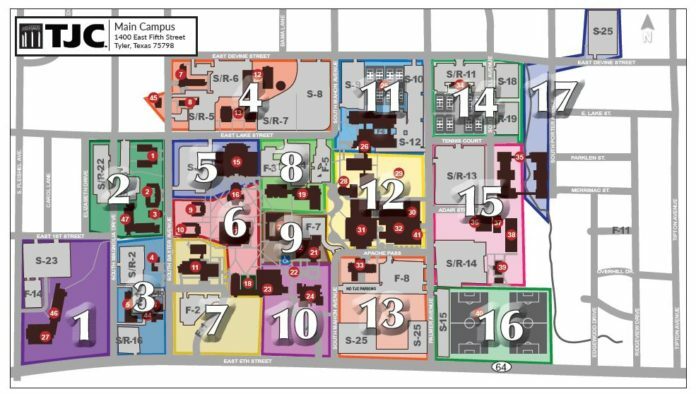 “We then broke out the campus into seventeen different zones, or ‘spots,’ and all seventeen spots were adopted by organizations,” explained Tyler. Student organizations who adopt a spot on campus promise to meet and collect trash from their spot at least twice per semester. Signs around campus label which organizations have adopted certain spots. In the spring semester, recycling days will be held on March 2nd, March 23rd, April 6th, April 20th, and May 4th from 11:00 am to 1:00 pm in the parking lot behind Potter Hall. Students may recycle #1 and #2 plastics, cardboard, paper, newspapers, magazines, and magazine stock paper. Students can also volunteer at Arbor Day from 2:00 pm to 4:00 pm on March 5th. Volunteers will plant 25 trees on the Jenkins lawn. “We’ll have food and T-shirts,” mentioned Tyler. I wouldn”t compare Gabby to MoNique. Gabby is willing to go along with the bullsh-t like most. Gabby is severely underpaid in the business but keeps her mouth shut because Lee is the only person who will hire her consistently. Not everybody is going to do that. And part of being a comedian is saying “vile things on stage. It”s like Monique has to play by different rules because she”s a black woman. Where”s the outrage when Kevin Hart drags his ex wife in his standups? MoNique is not the first to have a problem with Oprah. Oprah has controlling issues where she punishes/cuts off people for not doing what she tells them to do. Ask the Obamas. Ask Iyanla. Ask Whoopi. And believe me there are more. But the rule is you don”t talk about Oprah in public. MoNique just said eff it, I”m calling her out and Oprah is making her pay for that choice. Tyler and Lee have also been called out by others too. They aren”t perfect. This rule we have in the black community of treating Oprah, Tyler, etc. like gods is disgusting. They aren”t above reproach. And I wouldn”t compare Will, Halle or Denzel to Mo”s situation. They aren”t getting paid $50,000 for a film and told by black directors to take low pay for another project down the line. That was messed up.